Sometimes an idea comes along that is so simple, and yet so totally ingenious that you just have to stand up and slow clap the dudes that thought it up, ‘Lucas’ style. 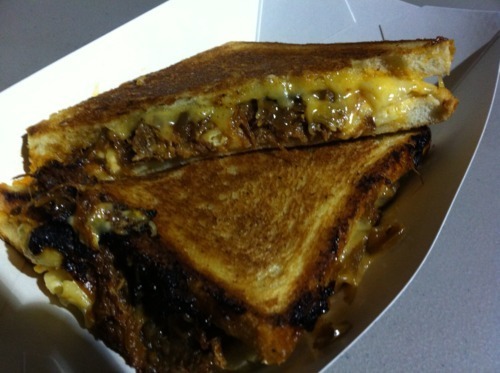 So we applaud the comfort food genius that is Los Angeles’ Grilled Cheese Truck. What’s all the more awesome is that these guys take such a staple, classic, comfort food and reinvent it with panache too. It’s testament to how well they do it that I’ve seen queues for this mobile eatery easily stretch 20-plus long. Our first visit attempt was at the fairly legendary Abbot Kinney First Fridays festival in Venice. The trouble was we’d already tried five trucks by the time we spotted them. Dammit. And those queues are there for good reason; their Cheesy Mac And Rib is hugely satisfying. The barbecue pork was saucy-sweet, soft and worthy of a place all of its own on a menu. The mac ‘n cheese was heavy on the gooey cheese, sticky yet still trying to escape from every opening, and hinted a savouriness that balanced with the pork brilliantly. One hell of a sandwich. I’m pretty sure I put this away in under ten mouthfuls it was so good, and if we weren’t going on to somewhere else for more food, I would have had another. A bang up job, and a must for anyone In L.A. who has only got time to visit a handful of food trucks.